The Oncology Service at the Auburn University College of Veterinary Medicine is launching a clinical trial to test a new melanoma treatment drug for dogs. 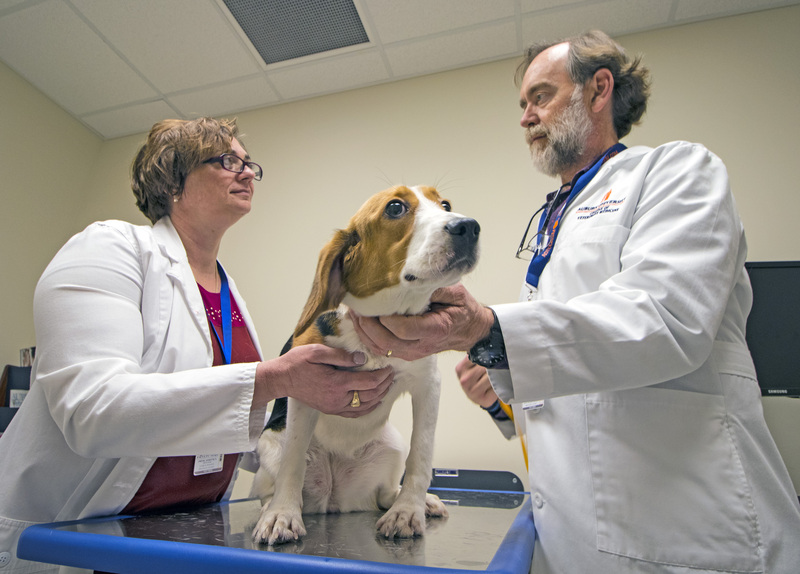 Dr. Annette Smith, left, the Robert and Charlotte Lowder Distinguished Professor in Oncology with the Department of Clinical Sciences, and Dr. Bruce Smith, a professor in the Department of Pathobiology and director of the Auburn University Research Initiative in Cancer, or AURIC, are shown with a canine patient in an exam room at the Wilford and Kate Bailey Small Animal Teaching Hospital. Dogs, like their human companions, can be susceptible to skin cancer, and the Oncology Service at Auburn University’s College of Veterinary Medicine could use the help of man’s best friend in launching a clinical trial to test a new melanoma treatment drug. “This study is designed to test a new drug that may be useful in treating melanoma, or skin cancer, which most commonly occurs in the mouth in dogs,” said Dr. Bruce Smith, a professor in the Department of Pathobiology and director of the Auburn University Research Initiative in Cancer, or AURIC. Dog owners who are interested in enrolling their pets into this clinical trial must do so through the Oncology Service at the college’s Wilford and Kate Bailey Small Animal Teaching Hospital. They can be referred by their primary veterinarian, according to Dr. Smith. The treatment, as well as surgery to remove any tumor left at the end of the trial, will be provided at no cost to the owner. The trial initially is about a five-week program, Dr. Smith said. It involves the dog owner bringing the animal in for an initial evaluation. Dr. Smith said this drug is not chemotherapy, but rather, a protein-based medication that has been tested on dogs in a clinical setting with no known side effects. Dog owners who believe their pet might be a candidate for participating in this clinical trial can contact the Oncology Service at the Bailey Small Animal Teaching Hospital at 334-844-4690, and ask for the Oncology Service. More information about this clinical trial can be found on the Oncology Service website. The study is an example of Auburn faculty working toward life-changing solutions to meet pressing global health issues.